Earlier this summer The Anou Cooperative surpassed $1 million USD in total sales since we launched the Anou market place several years ago. This is a major milestone for any business. Businesses are hard. Only about 6% of business ever reach $1 million USD in sales. For Anou, this milestone is special because it was achieved by the effort of people erroneously believed to not be business savvy at all: artisans. Artisans across the Anou community have to make a huge jump and take on large challenges to transition to selling directly to customers. In addition to photographing and posting their own products, there are the challenges of how to scale their businesses and manage their growth. It’s not an easy learning curve. The biggest learning curve of all is that of Anou’s artisan leaders. Artisan leaders work as a team by working shifts at Anou’s HQ in order to help manage quality, manage materials for the artisan community such as wool and dye work, collaborate with partners such as our retail, shipping, donor and government partners, and help advise newer groups on how best to organize their cooperatives. Through this work, artisan leaders like Kenza of Association Tithrite, Brahim of Association Ighrem, Mustapha of Cooperative Nahda, Rachida of Cooperative Tiglmamin, Rabha of Cooperative Tamlalt, Fatiha of Cooperative Tifawin, Halima of Association Zaouia, all have set the bar for what artisans can achieve. This milestone and the success of all Anou’s artisan leaders all comes back to you, our supporters. To everyone who has helped advocate on Anou’s behalf, or purchased a product (or several! ), told their friends and family or had their orders delayed due to various growing pains, none of this would be possible without you. The Anou community is deeply indebted to all of our customers and partners who have made this milestone a possibility. There is still much more work to be done in building Anou’s community and reshaping Morocco’s craft economy but with all of your support we know the best is yet to come. Kenza (left) of Association Tithrite. One of the more common questions we receive is do the wool rugs artisans list on Anou shed? If so, how much? And lastly, is there anything that can be done to minimize shedding? Since we’ve launched the Atlas Wool Supply Co, we’ve invested an immense amount of time researching and testing various wool samples from across Morocco to find actual answers to these questions. The first thing to know is that most natural fiber rugs will shed and all wool based rugs will shed to some extent. This is normal. Wool is a great fiber because it has a natural crimp, which the enables the wool fibers to interlock with each other and limits the rate in which individual fibers to be pulled from the yarn. The crimp and spinning technique with other natural fibers may increase or decrease the shedding of a rug, but wool is always a great option. When it comes to a wool rug, the most important factor to consider is how the rug was made. Most cheap rugs are often mass produced using machine tufted techniques where wool is punched through a latex base. Initially these rugs may not shed but as these rugs get older (starting at about a year or so), the latex begins to crack and the shedding will increase over time until every thread of wool falls out. In incredibly rare cases a company that produces machine made rugs, like Stitch in Casablanca, will use quality tufted bases made from natural materials that will extend the life of the rug immensely and minimize shedding. Again, such companies are few and far between. All of the rugs artisans list on Anou’s marketplace are woven by hand which ensures that wool yarns are integrated into the very structure of the rug itself and not just tufted. This substantially reduces the rate of shedding and outright eliminates shedding over time. Moreover, the wool yarn Anou artisans use is also spun by artisans from the Anou community. This ensures that each thread is inspected and the integrity of each thread is considered and spun just right to limit shedding. When considering a handmade Moroccan rug, there are important things to think about when it comes to shedding. The first is that you must absolutely know where the wool that was used to make the rug came from. If you’re buying from middlemen in Fez or Marrakech or from a reseller on Etsy, this is critically important because the sheep breed and the location where the sheep live all have an effect of the quality of wool in Morocco. For example, sheep in lower altitude areas (like Marrakech) have minimal crimp, have a higher likelihood of containing kemp (hairs that can’t be threaded into wool), and feature a very short fiber length. This is important because if the wool has minimal crimp and or fiber length, it will shed incessantly. And if kemp is present, the amount of shedding will push you to throw away the rug. All rugs made and sold in the Moroccan medinas (old cities) or by middlemen on Etsy, use wool from local markets. And unfortunately, local market wool comes from one of two places. The first place is from tanneries. This is more of an issue if buying a rug in Morocco in a medina, but it is not uncommon to have rugs made with wool chemically stripped from the hides of dead sheep. Why? Because it is widely available in the cities and is often free. If you bought a rug while in Morocco and seemed fine initially, but several months later it is shedding to a point where the rug is falling apart, you probably have dead sheep wool. We get an email about this about once a month from someone who bought a rug on their vacation and it’s so sad to break the news to them. The second place, which fortunately deals with live animals, are sheep from the plains of Marrakech, known as Sardi sheep. Sardi sheep have high proportions of kemp, super short fibre length and don’t take dyes very well. Often times Sardi wool quality is so poor that it can’t be mechanically spun so mills in Marrakech/Casablanca will mix in cotton, synthetics and actual plastics to make the wool thread functional. Because of all the these impurities and improper cleaning (and dye chemicals used in local dye markets), local wool is more likely to attract moths and larvae. Marrakech wool we had stored at our office for testing became infected with moths and larvae after a couple of months. The larvae completely ignored properly cleaned wool we sourced and cleaned ourselves that was stored in the same area. Most middlemen in Morocco and resellers on Etsy can’t verify where their materials actually come from. This is a picture of kempy, poor quality Moroccan wool. Anthropologie, is another great example of just how pervasive this problem is. They work with middlemen in Marrakech and therefore it should be no surprise that their Moroccan rugs not only fail to pay artisans well, they routinely get poor reviews for massive shedding problems. Check it out for yourself. And to answer NYCmom15’s question: no, the shedding won’t ever end. Customers leave complaints about shedding on Anthropologie Moroccan Rugs. Fortunately, there are sheep in Morocco that produce high quality wool that is equal or exceeds the quality of internationally known gold standard of New Zealand wool. These sheep live throughout the Atlas Mountains in higher altitude areas. Prior to starting Atlas Wool Supply Co, many of groups within the Anou community used their own flock of sheep, but this didn’t guarantee quality and we began to notice infrequent inconsistencies with rugs that they produced and we started these removing them from the site years ago. This is because it is becoming more common that villagers in the mountains will keep a Sardi sheep or two in their personal flock and just mix in Sardi wool into their materials. Most cooperatives that work with middlemen simply buy market wool spun with poor quality Sardi wool and explains why you can find dirt cheap rugs on Etsy, Ebay and in Marrakech. This is why we’ve had to build out the entire supply chain ourselves as it’s the only way to ensure the best quality wool for rugs that the Anou community produces. Currently, we’ve tested and built two supply chains of wool from the High Atlas and the Middle Atlas, and you’ll see these listed on Atlas Wool Supply Co. High Atlas wool generally comes from sheep in higher altitudes, which creates a longer fiber length to the wool, and decreases the amount and duration of shedding. 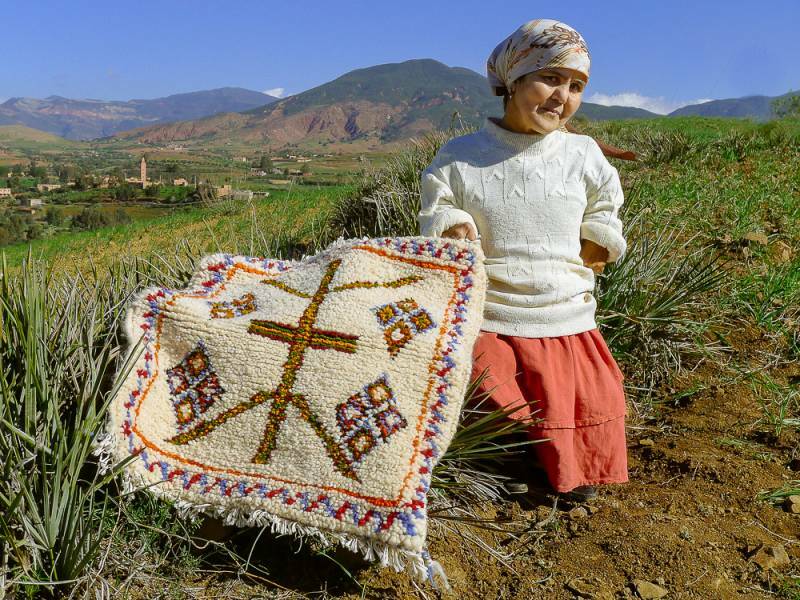 Further, cooperatives in the High Atlas Mountains traditionally use 2 ply, or double spun wool for their rugs. Pile knot rugs (or Beni Ourain rugs) with double spun High Atlas wools actually yield minimal to minor shedding that clears up after around a month after purchase. Moreover, these types of rugs tend to hold form and their look does not change over decades and can tolerate heavy foot traffic. The alternative is Middle Atlas wool. With Middle Atlas wool, the fibre length is slightly shorter than High Atlas wool. Further, weavers in the Middle Atlas tend to use 1 ply, single threaded wool. With these two factors combined, rugs from the Middle Atlas tend to shed a little more than rugs produced with High Atlas wools. Why then continue using Middle Atlas wool and not encourage groups to always use 2 ply High Atlas wool? First, because it is traditional and artisan leaders from this area felt that this was worth preserving. Second, and more important to customers, is that single threaded, Middle Atlas wools tend to age into those classic vintage, shaggy rugs over time. The moderate shedding is a part of that process and can take at least 3 months for shedding to clear. This look is very important to a lot of supporters of our community as well and is why we’ve prioritized such wool. We understand the importance of having a rug with minimal shipping immediately after a rug arrives. As such we’ve begun importing rug rakes and have made them available for artisans within the Anou community to purchase. We encourage artisan groups to use the rug rake to remove any excess wool and accelerate the shedding process before we send it out. If a group does not do so, the artisan team will rake the rug at our HQ as part of our quality control process so the rug arrives with minimal shedding. This won’t prevent shedding out right, but will make having a Moroccan wool rug a great experience from day one. Members of Association Afous G Afous, Association Tithrite and Association Nahda use techniques we’ve developed to remove excess wool and minimize shedding upon arrival at a customer’s home. After your rug arrives, there are more things you can do. First, is to ensure that you clean it often as we described on a previous post about how to clean your rug. Cleaned rugs mean less damage to the wool fibers and in turn results in less shedding. Second, we’d recommend purchasing a rug pad. This will help reduce any damage to the fiber so broken fibers don’t fall out over the course of the rugs life. This is in addition to how a rug pad makes a rug feel even more soft. Lastly, we recommend getting a rug rake of your own and brush the rug once a week until the shedding stops. Even after the rug stops shedding, an occasional comb over with a rug rake can keep the rug plush and prevent it from matting. Picking the right rug with authentic materials from your preferred region, combined with these proper cleaning as described above, will minimize unwanted shedding and ensure that your rug outlives your great great grandchildren. This is admittedly a lot of information so if it feels a bit overwhelming just give us a shout at hello@theanou.com and we’ll help you make a great decision based on your needs. We’ll look forward to hearing from you! Not only was this rug designed by Kenza of Association Tithrite, it was the first rug made using Anou’s own in house sourced wool and non-toxic, environmentally friendly dyes. This past winter, a cooperative within the Anou community received a large order and they struggled to meet timelines that they had set themselves. Each time a weaver began on the order, they’d get sick, and another artisan weaver would begin working. The weavers said that they just all happened to get subsequent colds but it was clear something was a little off. Whatever was happening, it seemed to go deeper than an excuse. Curious, we decided to bring the weavers to work on the order at our HQ so we could better monitor the progress of the order and see what the real issue was. Within 24 hours of having the weavers at our office, the artisans eyes started to swell and if we had not stopped them from weaving their eyes would have swollen shut. The artisans were sick alright, but it wasn’t from a cold. They were having severe allergic reactions from the materials they were weaving with. We have always felt that artisans were sick more often than the average population but we never had any data to prove it. Perhaps it was the result of a wide range of challenges often faced by those in rural, poor areas. But after bringing the weavers out to our office it was clear that materials artisans use, whether they realize it or not, seems to play a significant role in the quality of their health. And what it certainly proves is that there is something severely wrong with the craft material market that is literally and figuratively killing the artisan community of Morocco. To ensure that we can build the future of Moroccan craft in Morocco, we can no longer overlook the lack of safe, natural, quality materials in Morocco. Ensuring that artisans have access to quality materials may seem like a simple problem to fix, but like many things, the problem is the result of a vast range of complicated problems. And yet after nearly a year of immersing ourselves in the material market of Morocco the source of all these problems find their roots in how the Moroccan artisan economy is structured. As we’ve wrote many times on this blog before, middlemen keep on average 96% of the final selling price of products on the artisan market. We’ve come across groups where middlemen don’t even pay artisans in cash, and simply pay artisans in more material to make them more product. Middlemen in many cases have optimized the labor cost to zero. Yet there is still cut throat competition, so materials becomes the next place of focus to maintain margins. Therefore, every decision made by middlemen is focused on eliminating any costs and cutting any possible corner to get the cheapest material available. Since middlemen control the majority of the market, their demands dictate what artisans largely buy. One of the most prominent sellers of craft material in Morocco now sells more than 90% synthetic material imported from India and China. When asked why he didn’t sell authentic material that could theoretically be sourced locally, he said that middlemen don’t buy natural products, and the artisans don’t earn enough from their work with middlemen to ever afford natural products themselves. What is odd is that Morocco is flush with natural materials — the same natural materials that gave rise to the artisan sector of Morocco to begin with. It isn’t impossible to find natural materials like wool but it isn’t so straightforward sourcing it. In some cases, sourcing natural materials can be worse for an artisans’s health than a synthetic. For example, groups who use wool instead of acrylic threads take the wool to dyers in Marrakech and Fez to create the colors they want. To properly dye 1 kilogram (2 pounds) of wool and chemically bond the dye to the wool while ensuring no environmental impact can take up to two hours of work. After working in the dye tanneries for several months we were shocked to learn that the dyers were using cheap dyes and cutting corners by skipping the chemical bonding process by ‘gluing’ the dye the wool using heavy concentrations of toxins like formaldehyde. This process only takes 20 minutes to dye several kilograms of wool. Not only does this dye become incredibly prone to bleeding, it affects the health of anyone who comes in touch with such wool including the end customer. If you ever wondered why Morocco’s souq and markets have a reputation for bleeding rugs or causing allergies, here’s your reason why. What makes this even more difficult to navigate is that it is nearly impossible for anyone to find out information about the true source and make up of such materials. For example, wool dyed with formaldehyde may bleed in seemingly sporadic number of washes, not necessarily the first wash. So a wool seller or dyer can tell an artisan that the wool is safe and non-bleed, run it through a basic bleed test in front of the artisan, and then the material will bleed after the artisan already sold a product to their customer. In some cases, the stories sellers tell take on a life of their own. For example, the incredibly popular material cactus silk locally known and sold as sabra isn’t even grown and processed in Morocco. In fact, all locally available Moroccan sabra is a semi-synthetic that is imported from India. Even after months of research we cannot find any evidence that sabra is or ever was commercially grown and processed in Morocco. What we have learned early on in building Anou is that if you want to do something right in Morocco you just have to do it yourself. As such, since the Fall of 2016, we’ve been learning and testing ideas and processes to develop our own in house material sourcing operation for the Anou community. And after many months, we’re excited to announce the launch of the Atlas Wool Supply Co, Morocco’s only source for quality craft materials. Our vision is to revive supply chains of all traditional Moroccan materials and provide them at cost to artisans of the Anou community. Since the majority of our artisans are weavers, the first material line we have developed is for wool. We have set up full vertically integrated, environmentally sustainable, wool sourcing operations in both the Middle Atlas and High Atlas Mountains. Anou artisans are employed via living wages to identify shepherds and sheer wool directly from sheep as well as scour and spin wool. When the wool is spun, it is shipped to our HQ where Anou’s artisan team is trained to dye wool in thousands of colors using premium non-toxic synthetics and locally sourced natural dyes. Anou artisans can now simply pick up the phone or send a Whatsapp message and place an order for any color they wish, whether it be for a new design or for a custom order, and have their requested materials shipped directly to their village. For the first time artisans who are a part of Anou can guarantee that their materials are of high quality and free of toxins that are harmful to the health of people and the environment. 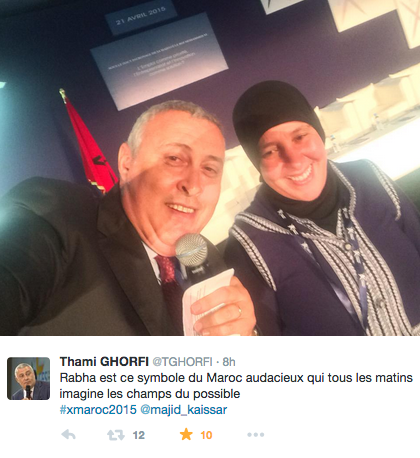 No one else in Morocco, middlemen or otherwise, can guarantee this simple important fact. Knowing this, why put your health and the health of artisans at risk when buying products from people who cannot guarantee where their materials came from? We’ve received so much initial excitement from our sample materials that we’ve made our materials available for purchase at www.atlaswoolsupply.co. We plan to catalogue ever color we have ever dyed in order to create the most comprehensive collection of wool colors online. So even if you are not in the market for a rug just yet but you are a knitter or a weaver, you can now support the Anou Cooperative by purchasing materials from the Atlas Wool Supply Co. All proceeds generated from each sale goes towards Anou’s general budget to onboard and provide further training for artisans in the Anou community. Already, companies like The Citizenry and organizations such as Turquoise Mountain have already begun to source from us for their projects. And starting next month, all major yarn shops in London will be carrying our materials for sale. With your support, we’ll never have to worry about whether artisans are getting sick from the materials they are weaving nor will materials and colors ever be a limit to the creativity of Moroccan artisans. Mustapha Chaouai of Association Nahda gathers wool samples from shepherds from around the Middle Atlas mountains. The samples wewre sent to labs for quality and fineness tests. At Anou’s HQ, Rabha Akkaoui trials wool scouring techniques learned from studying the processes of New Zealand wool companies. Anou provides scoured wool to cooperatives from across the Middle Atlas and High Atlas, like Imelghaus, to thread. The cooperatives use the income to supplement their income from their sales on Anou. At Anou’s HQ, Kenza of Association Tithrite dyes wool that was requested by members of the Anou community. Anou ships the dyed wool directly to artisans across the country. Brahim El Mansouri uses Anou’s color coding system to identify the dye mixes to create specific colors required for a custom order. Brahim El Mansouri, woodcarver, co-founder and president of the Anou Cooperative, shakes hands with Minister of Handicraft H.E. Dr. Fatima Marouane after signing an unprecedented agreement. After two and half years of writing proposals, meetings and hard work, the Anou Cooperative has finally signed an unprecedented agreement with Morocco’s Ministry of Handicrafts, Social Economy and Solidarity. The agreement elevates The Anou Cooperative to an official partner of the Ministry — a status traditionally reserved for government agencies and large international organizations. More specifically, the agreement creates the framework for the Ministry to include members of The Anou Cooperative in its programming and initiatives, share data and research on Morocco’s artisan economy with Anou’s artisan leaders, and work closely with Anou’s artisan leaders to create policy that better enables artisans of the Anou community to grow their businesses, such as streamlined customs and export processes. Even more exciting is that through the agreement the Ministry has officially endorsed the Anou Cooperative as one of its preferred means to buy from artisan associations, cooperatives, and small businesses across Morocco. It is truly difficult to underscore the importance of this agreement. After traveling across Morocco and meeting with hundreds of artisans over the past several years there is a tangible feeling of shared helplessness amongst the artisan community who feel they have little control over their future. What often frustrates and isolates artisans the most is the feeling that those elected and chosen to represent their interests in Morocco’s government fail to do so and rarely interact with artisans as serious stakeholders. Enabling the Moroccan artisan community to build the future of the artisan economy in their country starts with instilling the belief that they actually can. Nothing is more powerful in creating this belief than when Brahim El Mansouri, the president of the Anou Cooperative, a woodcarver, is able to sit down at a table with the Minister of Handicraft as equals and sign an agreement that will alter the future of artisan craft in Morocco. None of this would have been possible without the tireless efforts of the visionary support of those at the Ministry such as Boubker Mazoz, Nada Baâl, Adil Ibnoutalib, Abdelkarim Azenfar and of course H.E. 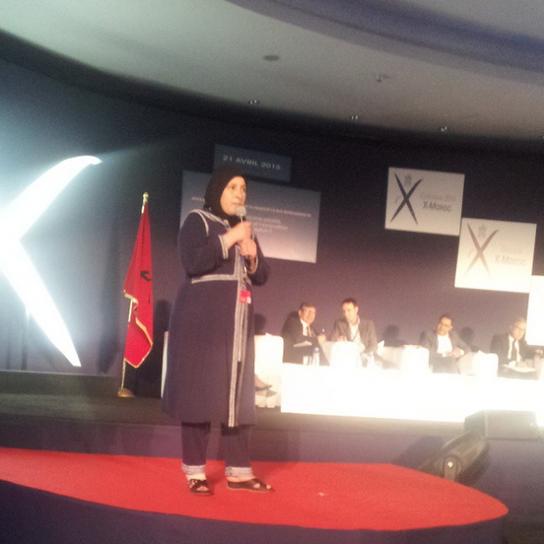 Minister Dr. Fatima Marouane. This agreement is a testament to how committed the current administration is to building the artisan community and social economy of Morocco. With an inspired community of artisans empowered by an endorsement and a true partner in their government, it is clear that the best days of Morocco’s artisan community are ahead of it. 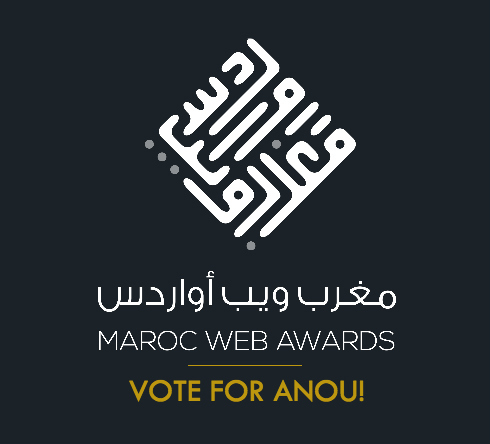 Anou’s New HQ in David Beach, Morocco! Anou’s new HQ in David Beach. We’re so incredibly excited to announce our new HQ in David Beach, Morocco! This move has been a couple of years in the making. Through 2014-2015, we have been building a decentralized leadership team and structure for the Anou community. This structure created deep bench of six artisan leaders that could help manage many aspects of Anou’s operations. However, by the end of 2015 our decentralized structure could no longer effectively meet the growing demands and complexity of Anou’s operations. In December 2015, we launched a pilot and brought out artisan leader Rabha Akkaouai to work full-time at our office in Rabat. After the first month of full-time work, Rabha was able to get one on one attention and training that should couldn’t receive remotely. As a result, her ability and knowledge increased exponentially. For example, after one month of full-time work at Anou’s office in Rabat she was successfully managing all payment transfers that are required to send the money from a customer to an artisan’s bank account. We eventually brought out all artisan leaders to work in full-time shifts of either two weeks or one month at our Rabat office. Like Rabha, all artisan leaders had huge jumps in knowledge and an increased ability to manage Anou’s operations. As a result, we prioritized finding a HQ that could enable a large number of artisan leaders to live and work full-time on Anou’s operations. We also wanted a space where the artisan team and artisans from the community could receive tailored support across all critical areas that the Anou community faces. Our new place in David Beach will enable us to do exactly that. Our new HQ includes an office, a large design studio and a dormitory that can accommodate artisan leaders, visiting artisans, and soon, leading experts from around the world. It is also only 30 minutes from Rabat and Casablanca so that the artisan team can manage our shipments and other necessary parts of our operations. Over the next several months we will begin sharing how we will be putting our new space to use. We have no doubt that our new HQ will accelerate the growth of Anou’s artisan leaders and the rest of the artisan community in Morocco! Rabha Akkaouai of Cooperative Chorouk and Mustapha Chaouai of Association Nahda manage orders and payments from Anou’s office. At the new design studio, designer Sabrina Krause Lopez provides visiting artisans with design support on their new product ideas. Anou’s HQ is a short 4 minute walk from one of the most beautiful beaches in Morocco — a source of endless inspiration for all visiting artisans. Anou’s team and artisan leaders set up a bonfire on the beach to celebrate the end of another successful work week. Last October, we were excited to announce that all shipments above 5kg would begin to be shipped by DHL. Prior to working with DHL, our average shipping time to the United States was 3-5 weeks. Now our shipping average is down to just 5-13 days with shipments delivered by DHL. Yet we know we can do much better. Our goal is to ensure that orders fulfilled by any artisan in Morocco will arrive at their customer’s address in 5 days flat. This means the waiting time for someone in Los Angeles who is buying a rug from a remote village in Morocco would be the same as if their friend sent a letter to them from New York via USPS standard mail. To do this though, Anou and the artisans of our community have to overcome numerous, complicated, yet solvable challenges. As such, we wanted to give all our supporters a look behind the scenes of what it takes for artisans to fulfill orders and how all of us are working to reach our goal of a five day delivery timeline. One reason why the logistics of shipping orders in Morocco is so complicated is that each artisan within the Anou community faces unique challenges, all of which require unique solutions. 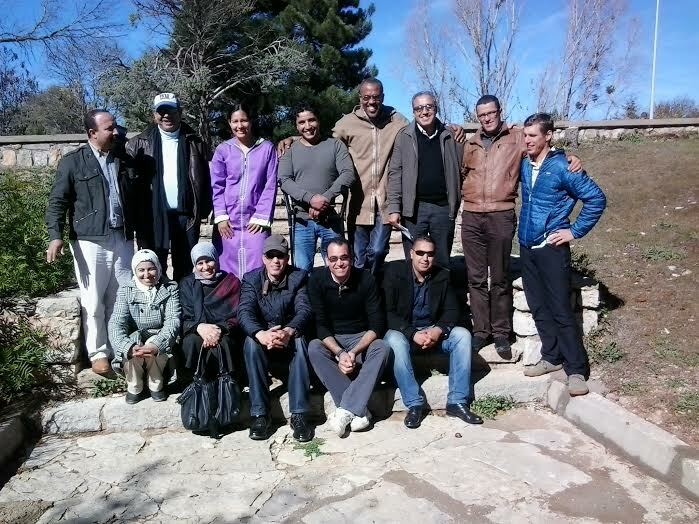 Association Timdokkals, one of the best selling groups of 2015, was in the unfortunate position of facing the majority of challenges that artisans across Morocco face when shipping products. Fortunately, their challenges make for a great case study. Every time a customer purchases a rug from Association Timdokkals, the women receive a text message containing the address where to ship their order. Within 24 hours, the women prepare the order and package it for shipment. The women typically work in shifts at the association — half the women work in the morning and half the women work in the afternoon. So whenever a sale is made, a designated woman from the active shift packages the order. 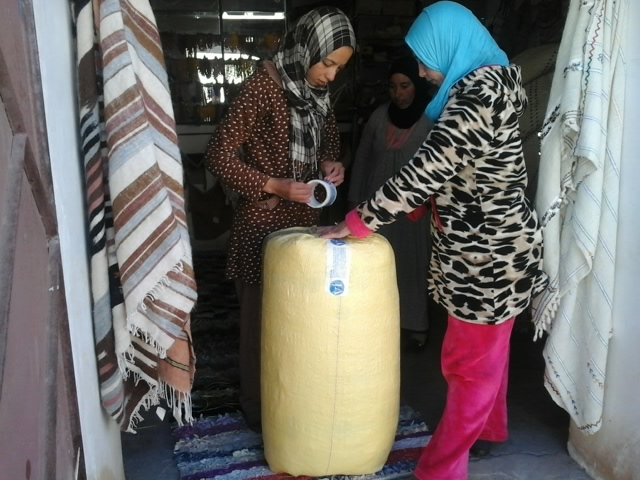 Sana, (left) is one of the weavers who helps with packaging Association Timdokkals’ orders. In the beginning of 2015, the president of Association Timdokkals or its members took their shipments to their local post office, about 5 kilometers away. However, their orders began to overwhelm the post office. By mid-2015, the post office, which has no paved road to it and is one of the most isolated post offices in Morocco, was shipping the highest volume of national and international shipments of all post offices in their province. In fact, many other post offices where artisans within the Anou community operate, have become the highest volume shippers in their respective provinces as well. Even better, because of these shipments, some post offices have become cash flow positive for the first time since they opened — decades ago. However, this success brings additional complexity. Timdokkal’s post office, since it used to ship so little, previously contracted a local taxi driver to ship out their mail. But the taxi driver could no longer fit all the shipments into his trunk. The driver eventually grew frustrated that he was no longer delivering a small bag of mail every week and eventually quit and refused to ship artisan products. Now, the Moroccan National Post Headquarters is rumored to have approved a shipping van for Timdokkal’s post office, but it may not arrive until next year. 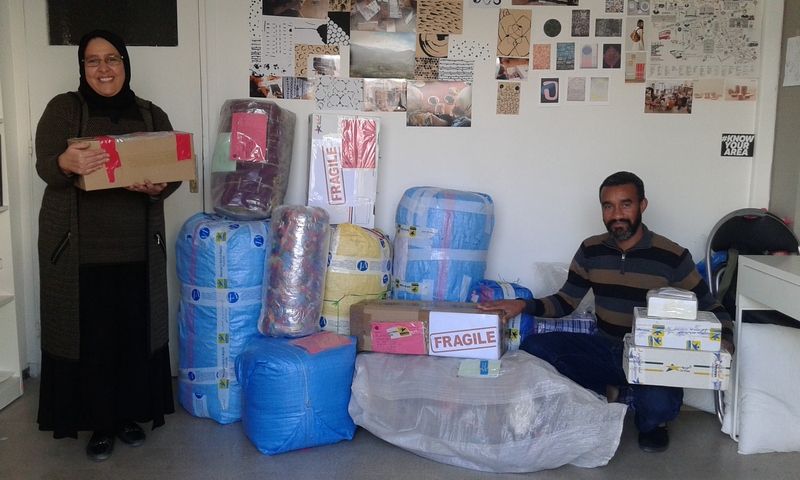 As a result, Timdokkals and two other artisan groups (The Imelghaus Cooperative, and Touda Bous-Enna) in the area that share the same post office have collectively begun paying a local taxi driver to drive their shipments to the Moroccan Post’s regional distribution center in Azilal until the new van arrives. After the women of Timdokkals package their order, they now walk it over to their local village store and they call their local taxi driver who comes and does one pick-up per day, if the mountain weather permits. 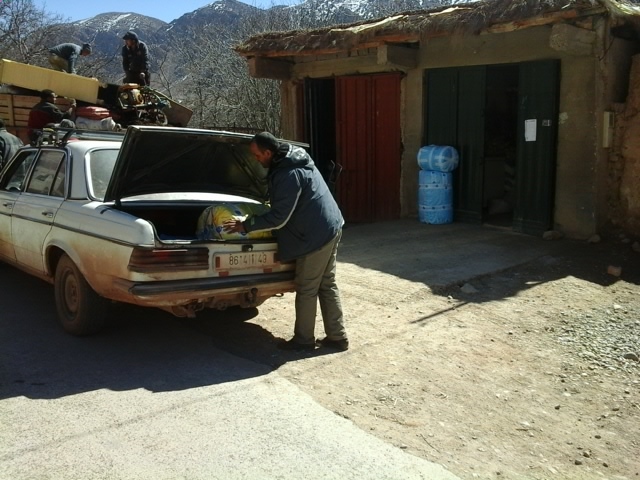 The local taxi driver stops by the village store to pick up people, and rugs. Once the order is dropped off at the distribution center, the order is then either shipped to directly to the customer or to Anou’s office in Rabat. If an order is under 5 kilograms, the artisans will ship it directly to the customer via standard international priority from their local post office (or regional distribution center in the case of Azilal). When an order is dropped off, it usually takes anywhere between 2-5 days for an item to arrive at the Moroccan Post’s international distribution center in Casablanca, where it is then immediately forwarded to the country where the customer lives. Currently, 70% of the Anou community’s orders are destined for the US and this is where it gets complicated. Once orders arrive at the USPS distribution center in New York, an order can sit for a day, or weeks, and we won’t know because the USPS won’t register the shipment until they move it, not when it arrives. The reason why standard shipping takes 3-5 weeks, is because of the USPS, not the Moroccan Post as is commonly believed. Other countries, including those as far as Australia and New Zealand, only take 10-15 days to arrive. It is because the uncertainty of the delays with standard shipping that prompted us to begin working with DHL. Our goal in the near term future is to have all artisans ship their orders directly to DHL’s warehouse from their village, but we’re not quite there yet. As of today, all of our DHL shipments are sent to Anou’s office in Rabat instead. 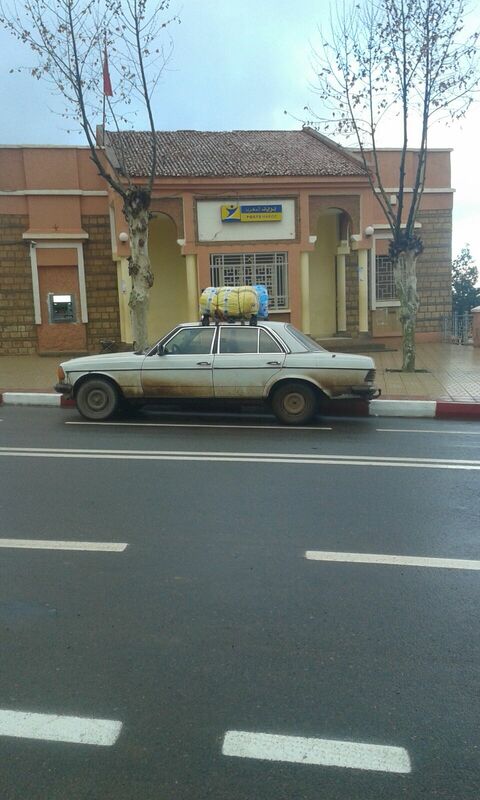 Shipping from anywhere in Morocco to Rabat takes between 2-5 days. Once the shipment arrives at Anou’s office, Anou’s artisan team inspects packaging and opens up select packages for artisans who may previously have received complaints to ensure an order’s quality before it is shipped shipped on. Most importantly, routing orders through our office is enabling us to standardized our labeling process and troubleshoot problems that may clog up our soon-to-be full integration with DHL (e.g. artisans improperly weighing their items or poor packaging for fragile items). 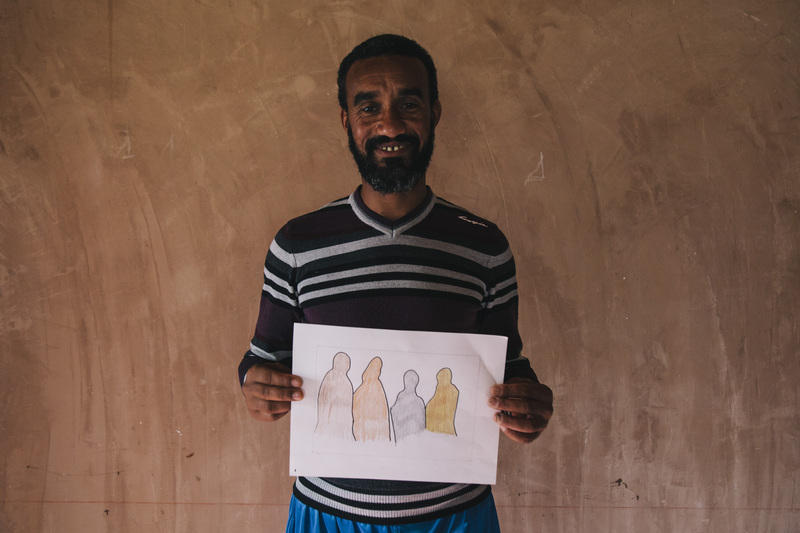 As we find problems with a shipment, artisan leaders, such as Rabha and Mustapha (pictured below) call up the artisans who shipped the item and teach them how to fix the mistake. Because of their work, the artisan leaders are significantly reducing the amount of errors made by the artisan community. Artisan leaders Rabha Akkaoui and Mustapha Chaouai inspect shipments before DHL picks them up. Once all the items have all been cleared at the office, the artisan leaders call a DHL courier, who then swings by our office and whisks off all our orders to DHL’s warehouse. 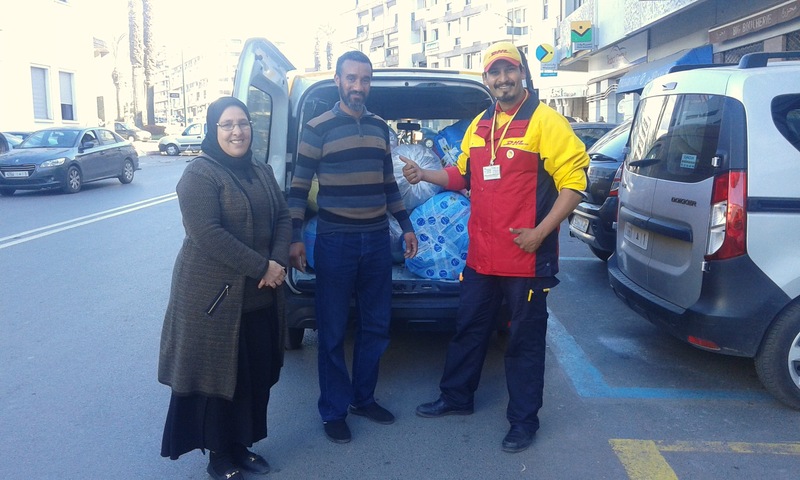 Abdullah, DHL’s amazing courier, picks up shipments from Anou’s office. DHL normally ships a package immediately and it arrives anywhere within the world within 72 hours. However, until we’re able to standardize all artisans shipments, DHL can only send our shipments on Saturdays. So with 2-5 days local shipping, and depending on the day it arrives in Rabat, items currently take between 5-13 days to arrive at their final destination. With the hard work of artisans in their workshops and Anou’s artisan team, we are quickly reducing our error rate and will integrate the community’s shipment within the next couple of months. And once we hit that milestone, all items shipped by the community will reach any corner of the world within just five days! NPR’s Marketplace ran a great piece that got to the heart of what Anou is all about. Listen to the whole piece at Marketplace! PCV Rebecca Levy: The Azlag Dagger Cooperative is going to America! Note: We’re excited to have our first guest post on Anou’s blog by Rebecca Levy. Rebecca is a currently serving Peace Corps Volunteer working in Kala’ Magouna. During her service she has been working extensively with the Azlag Dagger Cooperative and is now fundraising to bring the Azlag Cooperative to America! Learn more about this trip and the work she has been up to below! 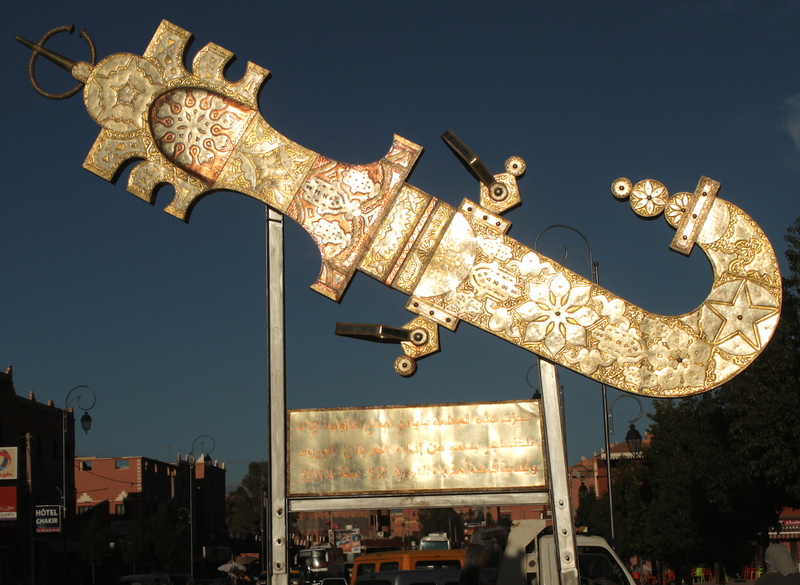 A 10 foot dagger commissioned by the local government, made by the cooperative this past year, a welcome sign as you enter the city of Kelaat M’Gouna (the city of Roses and Daggers)! It’s been a busy couple of months for the Azlag Dagger Cooperative, a unique dagger making cooperative in southern Morocco, in the town of Kelaat M’Gouna. With opportunities to attend two festivals in America this coming year, their efforts to make “English-friendly” advertising and sales has been upped. The cooperative has attended the Santa Fe International Folk Art Market, in Santa Fe New Mexico in both 2012 and 2013 — with the help of Peace Corps volunteers. After sales were not as high the second year they attended, the cooperative decided to take a year off of applying to the market and work to diversify their product line as well as improve their international selling skills. In the new year of 2015, we are pleased to announce that the president of the Azlag Dagger Cooperative will be attending a 2-week jewelry and gem show/exposition (JOGS) in Tucson, Arizona from January 29th-February 9th, 2015 and then again the Santa Fe International Folk Art Market in July 2015. Although, these international fairs are great selling and learning experiences for the cooperative, the cost of travel and lodging is quite a huge investment for the cooperative. To help cover the costs of these trips, I have launched a crowdfunding campaign to help fund the trips: https://www.indiegogo.com/projects/azlag-dagger-cooperative-artisan-fairs-in-usa/x/5471909 Furthermore, in order to help explain to international buyers the unique nature of the traditional Moroccan dagger, the dagger workers and I worked with an amazing film producer from Ouarzazate eNews to create a short promotional video for the Azlag Cooperative. Since the Azlag Dagger Cooperative is working hard to expand their presence online, the video was a great way to help international customers see how the daggers are made. The video shows in detail the handmade nature of the craft, explains the different types of daggers, and tells customers about the uses of a dagger. The Azlag Dagger Cooperative has a Facebook page, their online store on Anou, and a website. With over 60 customers working at the cooperative it is vital that they expand their market and sell their craft to the larger international market. The daggers they make are well known throughout Morocco and the cooperative is one of its kind! In addition to daggers, the men at the cooperative are skilled metal workers, making anything and everything from jewelry to lanterns to mirrors to beautiful tables. A new cooperative building is hopefully going to be built in the coming year and the executive team has big dreams for the expansion of their trade. Welcome anytime to Kelaat M’Gouna to visit this amazing cooperative! One unexpected lesson we’ve learned building Anou’s online store is just how many customers find us before — or after — a trip to Morocco wanting to buy directly from artisans. We used to put any visitor on TheAnou.com in touch with artisans in the community, but we ended that as soon as people started showing up extracting discounts and their guides started taking commissions from artisans. Instead, we thought the more sensible way to address this demand was to partner with socially conscious tour agencies and operators. We could provide them with all the information required so their clients could visit the artisans in the Anou community in person — something that we can attest there is a huge demand for. In return, partner tour agencies would help us explain the values of the Anou community to their clients during their trip. Most importantly, these tour agencies would not take commissions for any sales their clients made from artisans within the Anou community. We ended up pitching this idea to ten socially focused tour agencies in Morocco. But this led us to another unexpected lesson: just how difficult it would be to pull off. All but one agency gave us an immediate no. According to several of these agencies, many guides supplement their standard pay with commissions and would never agree to giving them up. This partially explains all those awkward experiences customers had with their guides on their trip to Morocco. 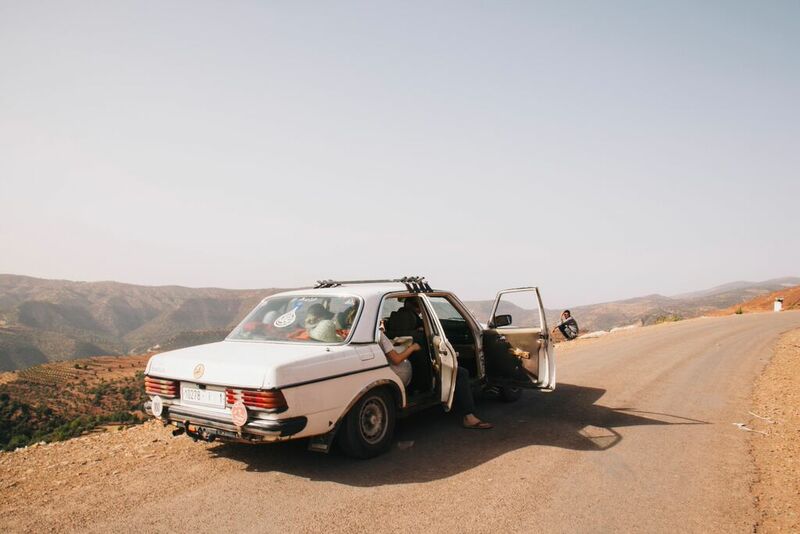 Moreover, as per Moroccan law, tour agencies in Morocco hire guides or drivers as contractors, not as full-time employees. So even if the tour agency wanted to agree to our conditions, they wouldn’t have the ability to hold their contractors accountable. One tour operator, Journey Beyond Travel, agreed to at least meet with us to discuss the challenges in realizing such a partnership. The owners, Thomas and Fazia, had a lot of knowledge to share on the topic because their guides had already rejected their efforts to eliminate the practice of commissions from their business years ago. The owners said their motivation in trying this was because commissions negatively affected the experiences their guests had on their trips. They also felt that the commissions didn’t line up with the ethics of their business. Despite all of this, they were still pretty hesitant to address this topic again with their guides and drivers. But what makes Thomas and Fazia different from other owners we talked to was that they had an impressive understanding of how things in Morocco work on the ground mixed with an unyielding desire to build a great tour agency that gives back to Morocco and their clients. This might sound like a marketing shtick, but when you consider that Thomas was a former Peace Corps Volunteer in Morocco and Fazia is just about to complete certification in sustainable development, well, it all just kind of fits together. Perhaps then it wasn’t so surprising when they decided to go all in and see if they could find a way to work with Anou. Over the last several months, Thomas and Fazia took the time to meet with all of Anou’s artisan leaders in person to learn about the needs of the artisan community. Similarly, they explained to the artisan leaders the needs of their guides. Throughout it all, they tried to find a middle ground that could work, which included ideas like increasing pay for their guides (which is already well above normal market pay). These efforts all culminated in a meeting last month where Kenza Oulaghda of Association Tithrite (http://www.theanou.com/store/13) presented Anou and our proposal to the guides of Journey Beyond Travel. The guides were initially skeptical of the agreement but Kenza, with the support of Thomas, Fazia and Aicha (JBT’s cultural coordinator, who previously was a program assistant for Peace Corps for ten years), was able to win the support of all of JBT’s guides and drivers. Their approval of this agreement is truly unprecedented and we believe it will serve as a significant first step in ensuring that artisans can benefit from tourism in Morocco. Kenza, bottom left, takes a picture with Thomas, Fazia and Journey Beyond Travel’s guides and drivers after their meeting. As such, we’re incredibly excited to announce Journey Beyond Travel as the Anou community’s first official tourism partner. From here on out, we’ll be recommending any guests to our site who want to visit artisans within the Anou community to Journey Beyond Travel (Full Disclosure: Anou will receive no commission for anyone we forward to them). We are now working on developing a comprehensive guide that will enable JBTs guests to select which Anou artisans they’d like to visit as part of their tour in Morocco. And of course, 100% of the money from any purchase you make during your trip stays entirely with the artisan. If you’re interested in learning more about the specifics of this partnership and Journey Beyond Travel, please reach out to us directly at hello@theanou.com or visit JourneyBeyondTravel.com. Note: We were sad learn of the passing of an artisan in the Anou community and the people who knew her best asked if they could write a short note about her. We posted it below in English and in Arabic. مجتمع أنو حزين حزنا عظيما بخبر الوفاة المفاجئة للسيدة فاضمة التويمي من تعاونية تايتماتين بسبب مضاعفات صحية. نتقدم بهده المناسبة الحزينة باحر التعازي لعائلة الفقيدةواصدقاءها و نساء التعاونية و كل من المه فراقها.لقد كانت فاضمة دوما الصدر الحنون و الصديق الصدوق، محبة للغير بشكل كبير، توثر الاخر على نفسها. لقد امضت حياتها مع كل من اخيها ووالدتها في منطقة توامة على سفوح جبال الاطلس. كانت فاضمة، دات الاحتياجات الخاصة مند الولادة، في في صراع دائم مع المرض، فلم تستطع التمدرس او العمل خارج البيت. لم تتدمر يوما مما اصابها بل كانت دوما سعيدة باعمالها التقليدية. و لتساعد في اعالة عائلتها و دفع ثمن ادويتها كانت فاضمة تصنع و تبيع زرابي ودمى و بعض اعمال التطريز اليدوية.وكانت تستفيد من بعض التداريب المتوفرة في اماكن مجاورة إلى أن انضمت الى تعاونية محلية حيث تميزت بافكارها الخلاقة. كانت حرفتها المفضلة حياكة الزرابي، تحيك وتصبغ الصوف المجزوز من الاغنام المحلية لتنسج اشكالا خاصة بها، وفي وقت فراغها كانت تساعد على تعليم الامهات و النساء الاخريات كيفية صنع الالعاب لمساندة التعليم الاولي في توامة.لطالما حلمت بان تسافر يوما الى الرباط. The Anou community is sad to hear the sudden passing of Fadma Etouimi of Cooperative Taytmatine due to health complications. We want to send our condolences to her friends, family and the women of Cooperative Taytmatine. Her community describes her as a person who warmed the hearts of all who knew her and quick to smile and welcome new friendships. She loved people and was known to give what little she had to those she felt had a greater need. She lived with her mother and brother in the small rural village of Touama in the foothills of the High Atlas Mountains her entire life. Born with a disability, she struggled with her health and was unable to attend school or work outside her home. Fadma never complained about her life though, and found joy in making traditional crafts. To help support her family and pay for her medicine, she made and sold carpets, dolls, and crocheted items. She attended trainings offered nearby and joined a local cooperative where she was known to be full of creative ideas. Her favorite craft was carpet weaving. She spun and dyed the wool sheered from local sheep and wove unique designs into her carpets. In her spare time, she helped teach mothers and other women how to make toys to support preschool education in Touama. She dreamed of one day traveling to Rabat. All proceeds will go to Mustapha’s association (Association Nahda) and cover the costs of future artisan-led trainings to grow the Anou community in Morocco. 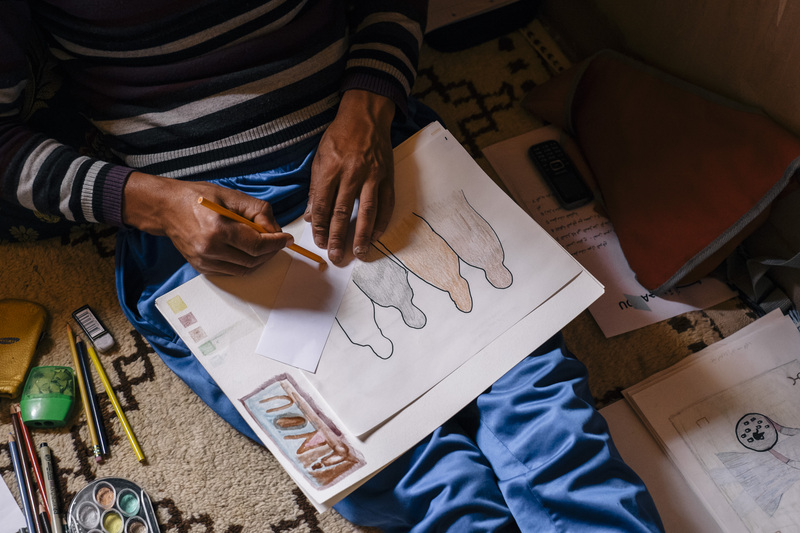 Mustapha’s works as a metalsmith in the small town of Oued Ifrane where he earns his income repairing metal doors, trucks, axles and pretty much any other metal object villagers bring to his shop. It might seem peculiar to many that an established metalsmith would establish a female weaving cooperative, but that is exactly what Mustapha did by founding Association Nahda. Mustapha, as one quickly learns after meeting him, is an anomaly in Morocco. When he was younger, he was always near his mother and grandmother while they weaved. Just by observing he became skilled in a craft that is reserved for women. With this rare skill set, he thought that he could help create jobs and opportunity for his wife and the women of Oued Ifrane. Today, Mustapha serves as the artisan director for the Anou community. Mustapha’s rug on display at the Common Thread Exhibition at the London Design Festival. The Common Thread Exhibition Launch! 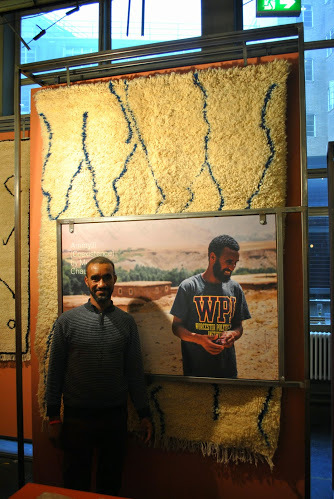 On Wednesday evening at Design Junction’s VIP and Press opening, the British Council and Anou’s artisan leaders launched the Common Thread Exhibition! The launch kicks off the third part of the British Council and Anou’s Common Thread project. The British Council flew all the artisan leaders to London just in time for the launch. The artisans knew their rugs would be on display but were kept in the dark as to the final design of the exhibition. Needless to say they were shocked to find their rugs amazingly displayed in the middle of a bustling festival! Anou’s artisan leaders after finding their rugs on display! The exhibition, in line with the Common Thread project, places its focus on the artisans leaders and their personal stories that inspired all their designs. The feedback so far has been outstanding. Many VIP and press visitors noted that in a festival of designers talking about the obscure artisans they source from, it was refreshing to learn about and see the artisans who made the products on display. And of course, many of visitors were in disbelief when they found out that the artisans designed the rugs themselves while working with designer Sabrina Kraus Lopez. 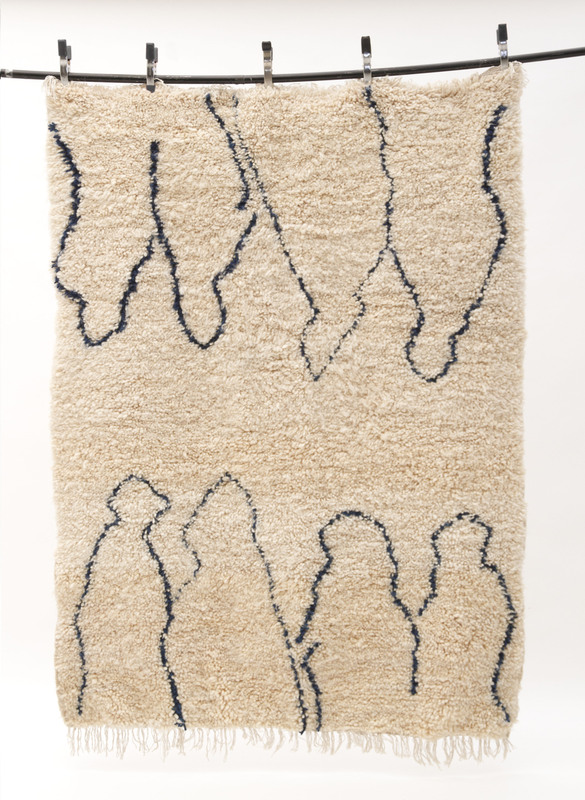 Each of the rugs the artisans designed will be on sale throughout the Design Junction event. To order one, just go to our Common Thread page at www.theanou.com/commonthread. The first person to buy a rug will be receive the rug on display, orders after that will be custom made and shipped from Morocco. All revenue from the sales will go directly into the artisan community! The exhibition was the result of many months of hard work by the British Council as well as Moira and Kieren of the Faculty, who designed the exhibition. 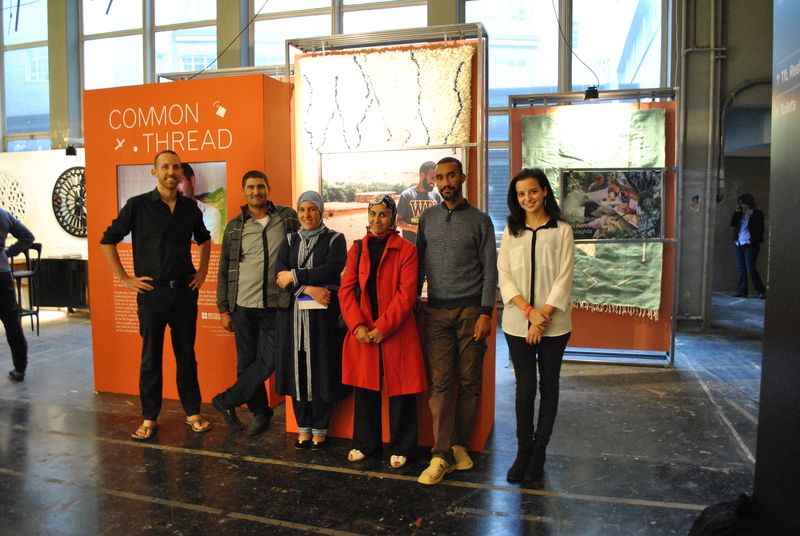 We can’t thank all the individuals and organizations behind making the Common Thread exhibition a reality! 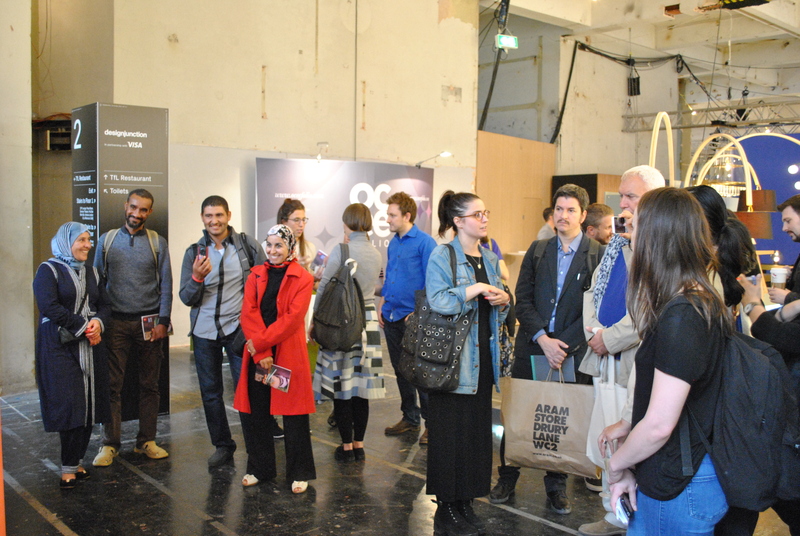 To see more pictures of the exhibition, take a look at our Facebook album of the launch! Come See the Common Thread Exhibition In London! Last week, all the artisan leaders completed their rugs they designed during part one of the Common Thread project and shipped them to London. The rugs will be the centerpiece of the Common Thread exhibition, which will detail the design process the artisans used creating their rugs during the project. We got a sneak peak of the exhibition designed by Moira and Kieren of the Faculty and it looks outstanding! 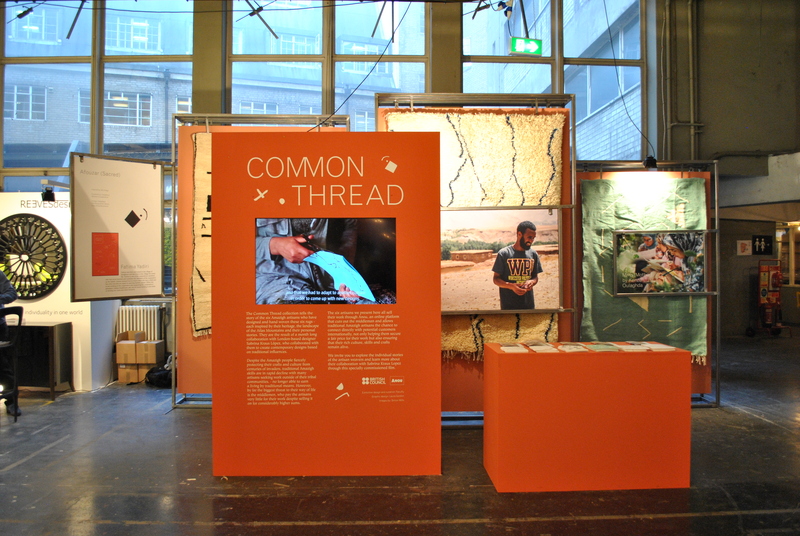 More excitingly, all of Anou’s artisan leaders will be making appearances at the exhibition to answer any questions you have about the Common Thread project and the Anou community. If you’re in London, we’d love to see you in person! Here’s everything that you need to know if you’re in the area! 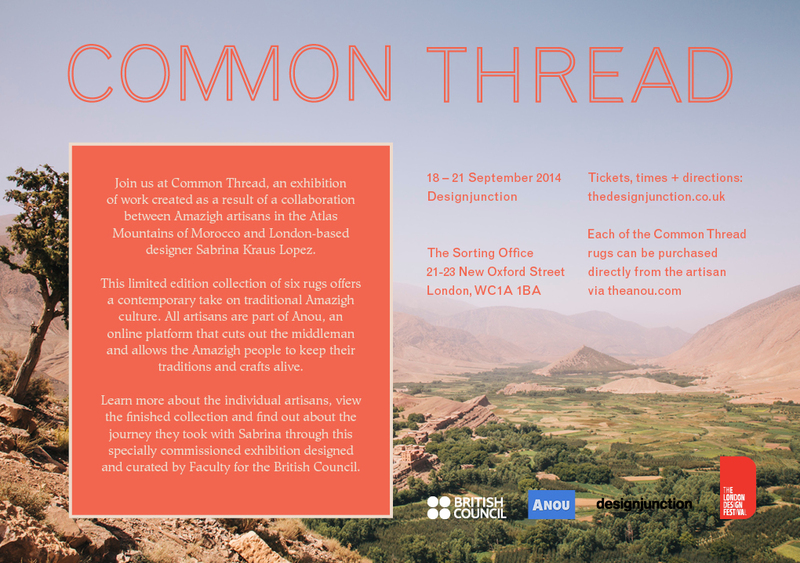 The Common Thread Exhibition will take place at Design Junction from September 17th-21st. Anou’s artisan leaders will be present at the exhibition on the 17th from 4-6pm. All days are free and open to the general public, the 17th however requires registration in advance (register here)! On the 21st at 12pm , the leaders will be taking part in a panel at the Design Junction. Admission to the panel is free and open to the public! Design Junction is located at 21-31 New Oxford Street and is within a short walk from the British Museum. Here’s a map. Learn more about the London Design Festival and Design Junction. As always, send us an e-mail at hello@theanou.com if you have any other questions! We’ll look forward to seeing many of you there! Want a Custom Made Rug or Craft? Learn How With Anou! Custom orders on TheAnou.com are easy. All you have to do is find any product that you love on the site and look for the “Request Custom Order” on any product page. Tip #1: When changing quantity, the site will automatically calculate bundled shipping savings for you! For example, ordering two items will likely cost less than just one due to savings in shipping. Note: This only applies when purchasing from the same association/cooperative. Once you perfect your custom order, enter in your e-mail and submit the request. Anou’s community supporter will follow up with you to confirm your order and answer any questions you have. If all is good, the community supporter will submit your request to the artisan who will then provide their official quote. If the artisan’s quote is different than the estimate we provided, we’ll let you know and you can confirm whether you’d like to proceed with the order or not. If you’re happy with the artisan’s official quote, we’ll ask that you provide the full payment upfront via a Paypal invoice. TheAnou.com will hold your payment as a deposit until the artisan completes the order. Tip #2: If you’re in Morocco, you can send the payment directly to our account at any Moroccan Post Office so you don’t have to pay any credit card/Paypal fees! Once the artisans begin we will provide you with weekly updates on the status of your custom order via e-mail. The artisan will do his or her best to take progress photos as they make your custom order request and we’ll e-mail you when they are submitted. Tip #3: Artisans add progress photos via the community’s Instagram account. Follow the community’s account if you want to the progress photos as soon as they are posted! Once the artisan finishes the custom order, they will post the item on their store on TheAnou.com for you to review. If you’re happy with the custom order the artisan will send it directly to you! If there is a problem with the order, we’ll promptly refund you your order! If you have an item that you’d love to have but isn’t listed on Anou, we might be able to help. Send us an image or description of what you would like at hello@theanou.com. Anou’s community supporter will see if the the design matches up with any existing cooperatives skill sets, designs and/or materials. If there is a match, we’ll submit it to the artisan and get a quote. Keep in mind that artisans do not create copies of images submitted from other websites. Depending on the situation, we may forward images to artisans so they can serve as inspiration for a new product, but we will never ask an artisan to recreate an item unless it is something that they designed. Tip #4: Have a product idea that you’d love to see on TheAnou.com? Add it to the community’s Pinterest research board! All items listed on the community’s board serve as inspiration for future products.